I shall be monitoring what happens to the Bay level during these stormy days. 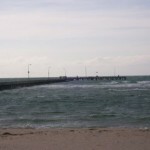 Day 1 Friday 16th May and Rye pier is disappearing. You will notice the tides recede further out and at full tide, are heavier and reach further into the shores. We shall be able to watch the effects of the dredging at the heads over this weekend. There is a strong full Moon on Tuesday around midday. 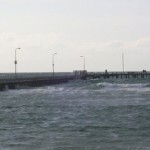 Kingtide warning and stormy winds and rain are forecast. The landscapes of our Bay and its surrounding shores are changing.